This dish is another homage to our time spent in Costa Rica last month for our honeymoon. From fried calamari for happy hour, to seafood stew with spicy marinara and tender squid rings and tentacles, I was in seafood heaven. 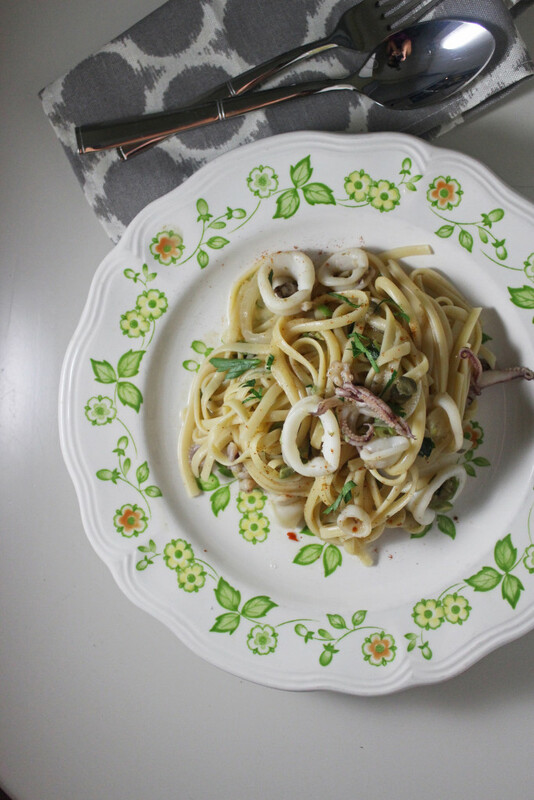 The seafood stew had the most tender rings of squid that I’d ever eaten, so soft and toothsome I was determined to make squid the moment I got back in my cucina. I realize the tentacles really freak people out however they are my favorite part so I made them stand out in these pictures (apologies in advance)! I bought a pound of this squid frozen from the grocery store and it was already cleaned so all I had to do was thaw it out then cut it into rings. I knew I wanted to go salty, briney and bright with a hint of spice so that is how this combination was born. 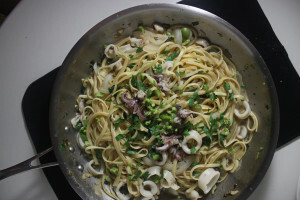 The capers, olives, white wine and lemon are the quintessential ingredients to a summer seafood pasta and they also remind me of the flavors I had while in Cinque Terre, Italy so what could be better? From Italy to South America, these flavors transport my palette all over the place and that is one of the most powerful things about smells and food, they conjure up even them most distant memories and serve them right to you. 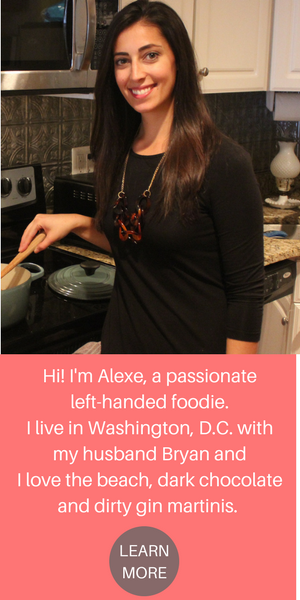 I am so sappy about food memories, sorry ’bout it! A few key things when making this recipe. One, make sure to reserve your pasta cooking liquid as it is the key to keeping this pasta moist and packed with flavor. I like to remove my pasta with tongs and put it right into my sauce, that way the cooking liquid is on stand by in the pot and is easy to ladle into the sauce. 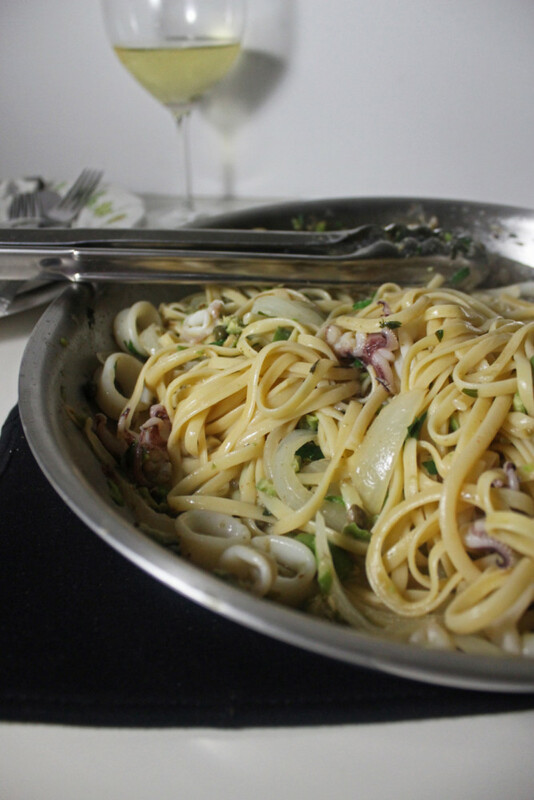 Two, do not overcook the squid. It should take about 3 minutes to cook and as long as it is opaque in color you are good to go. *If squid just really isn’t your thing, feel free to substitute shrimp or if you want a more meaty experience toss in some chorizo! 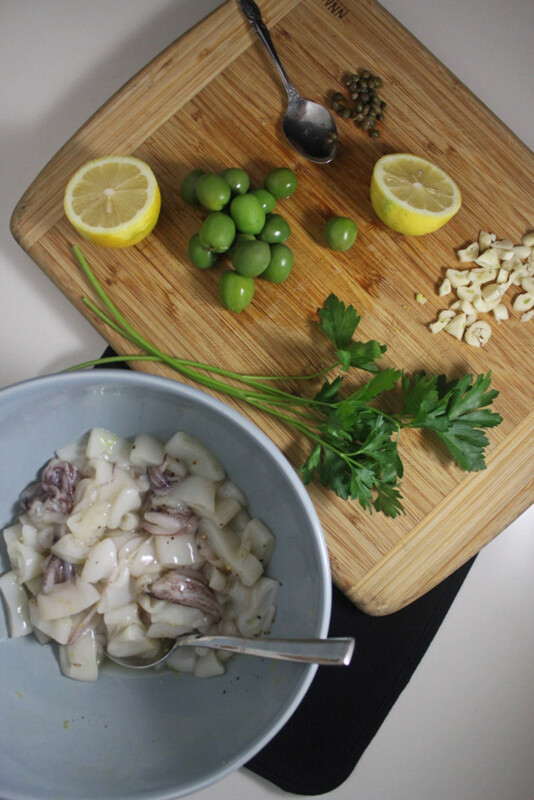 Marinate calamari rings in zest of one lemon and a pinch of salt and pepper and set aside. In a large saute pan, saute onions and garlic. Season with salt and crushed red pepper and cook for 5 minutes on medium. Add in the olives and capers and half of the chopped parsley. Get your water boiling with a big handful of kosher salt added to it. Deglaze pan with white wine and cook on high for 2 minutes, stirring to get all the bits off of the bottom of the pan. 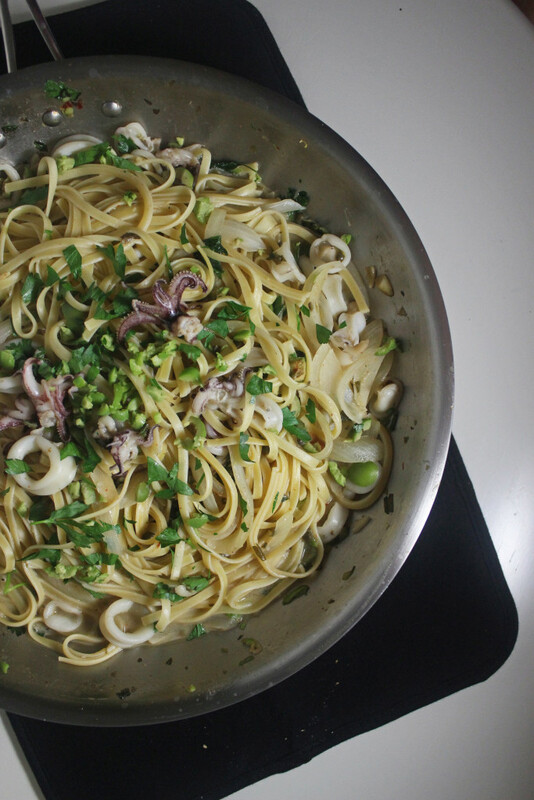 Toss in the calamari and cook for 3 minutes. Add in the pasta plus additional pasta cooking liquid as you see fit (I used 4 ladles) and saute for 2 minutes until all flavors are married. 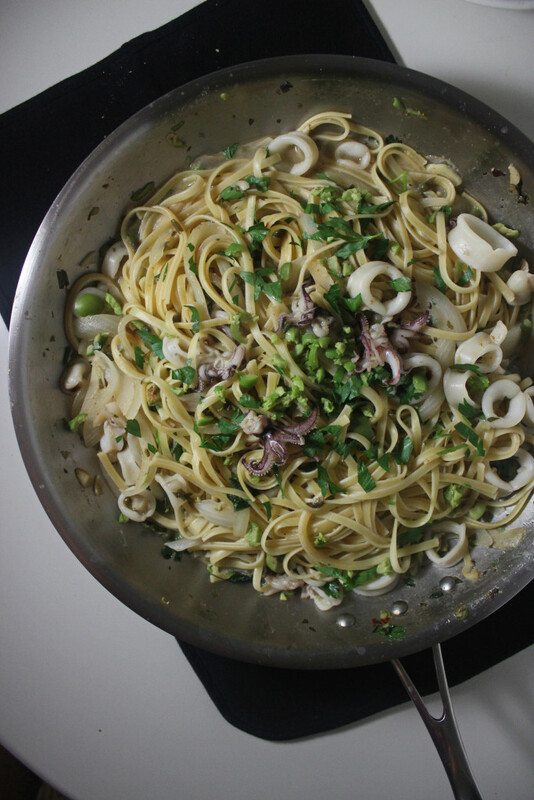 Finish with juice of ½ lemon and additional parsley and enjoy immediately.